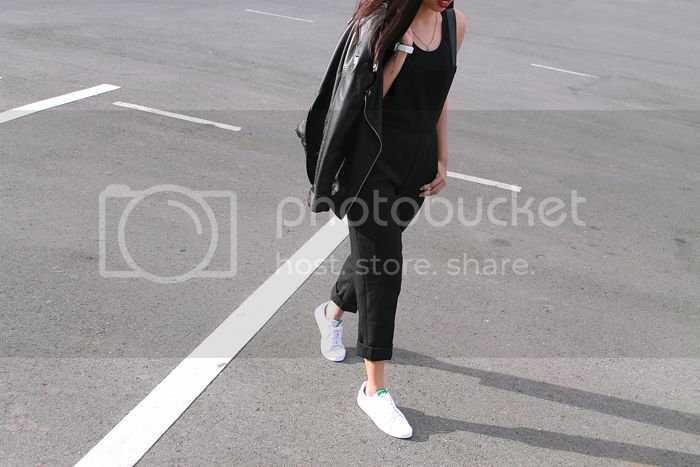 One two things every girl should have in her closet – a leather jacket and white sneakers. Ever since Paolo infected me with his love for the “shoe game”, coupled with the undeniable rise of sneakers being integrated into the most fashion week worthy outfits, I have been on the lookout for the perfect white sneaks. After searching and researching, I narrowed it down to two options – classic Stan Smiths or the Instagrammable all white Air Max. With the later being very hard to find, and with my long (but annoyingly extra thin) feet, the women’s version of Stan Smith’s was the way to go! Excuse me while I over use my new Miss Stan trainers and this undoubtedly chic pantsuit from ASTO – as the clothing cliche goes, they go with ANYTHING and EVERYTHING (and you can wear them for almost any occasion)!